We provide homeowners, contractors and architects a large choice of custom fabricated stone slabs for residential or commercial use. Granite applications will contain seams! These seams will be seen and felt no two installations will ever be the same. Placement of seams cannot be guaranteed and will be based on the size of the slabs allotted for the project. When installing new counter tops shims may be used to level tops especially for cabinets that are out of level. Austin Marble and Granite will do its best to work with customers existing cabinetry. Our hours of operation are Monday thru Friday 9a to 5p. 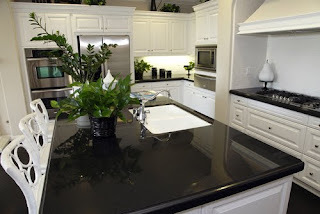 Makeover your kitchen with Granite Countertops.45 Square foot countertop order minimum. Restrictions may apply. Subject to change without notice. proud members of the Austin Chamber of Commerce. Many Color options available!45 Square foot countertop order minimum. Restrictions may apply. Subject to change without notice.